Today, Scandic has launched a Scandic Hotels credit card connected to its Scandic Friends loyalty program that will offer members more opportunities to earn points and faster ways to level up. The credit card is being offered in cooperation with SEB Kort and will be launched initially in the Swedish market. The largest loyalty program in the Nordic hotel industry, Scandic Friends, is celebrating its two millionth member, Ragnhild Fryd Johnsen from Bergen, who took the loyalty program to a new level. When she arrived at Scandic Sjølyst in Oslo, she was surprised by the staff and became the first guest to receive a lifetime “Top floor by invitation”, the highest membership level with selected benefits. Scandic’s loyalty program, which today is the largest and most popular in the hotel industry, has now gained its 1.5 millionth member. The special member, who will be rewarded with a night in a mobile Scandic To Go hotel room, was honored with flowers on arrival at Scandic Kungens Kurva in Stockholm on Wednesday evening. 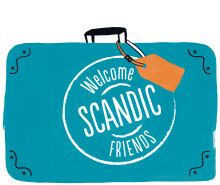 Scandic Friends, the Nordic hotel industry’s biggest frequent guest programme, has seen member numbers grow to around 930,000 since its launch in 2008. This autumn the programme is on track to exceed a million members. The most popular way to spend points is on reward nights at Scandic, but also with partners such as the Finnish hotel chain Lapland Hotels.